The goral, Nemorhaedus goral (Hardwicke) (Artiodactyla: Bovidae) has great importance as natural food resource, source for earning, recreation and materials for research. It is classify as endangered worldwide and assigned a status of vulnerable in Pakistan. 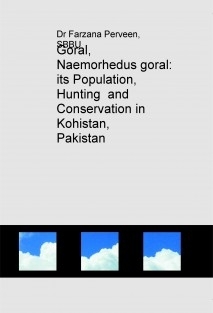 The population, vantage points, hunting, trapping pressures and migratory status of N. goral was determined during May-July 2010 in the Keyal and Pattan Valleys, Kohistan, Pakistan. Its population, hunting and conservation were studied in Kohistan, Pakistan. The present research is provided education and awareness to the people and hunters. Education to aware the people by WDP is still needed.